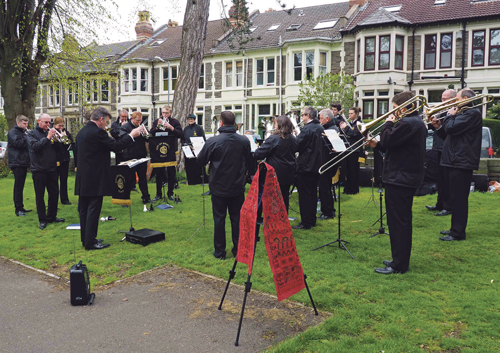 City of Bristol Brass Band performed at the unveiling of a blue plaque to commemorate Bristol-born entrepreneur, musician and impresario, John Henry Iles. Lord Mayor Councillor Lesley Alexander did the honours at a ceremony in St Andrews Park, outside his matrimonial home at 91 Somerville Road. The ceremony, which was facilitated by the Worshipful Company of Musicians (who award the Iles Medal for services to brass bands), was attended by his grandson and great granddaughter as well as members of Bristol Civic Society who designed the plaque and arranged the installation. The brass band concert attracted a good crowd of onlookers enjoying the musical interlude on a Sunday afternoon at the end of April. Band Chair, Steve Ellis, commented: "This has come about through a chance conversation between one of our members and his former neighbour, who had been researching the inventor Gordon Iles and became interested in his father John Henry. The band are delighted to have been able to help see the project through and mark the occasion with a short concert for this important local character who did so much to promote and develop brass bands in the first half of the 20th century." A colourful and diverse entrepreneur, John Henry Iles was born in Old Market in 1871 and had his first property overlooking St Andrews Park. The family greengrocer business was eventually taken over and ultimately became part of the Gateway supermarket chain. In his Bristol days John Henry also played for Gloucester CC at the same time as W G Grace. His interest in brass bands began in 1898, when visiting Manchester and attending Belle Vue Gardens, where he heard some of the band contest. He purchased the struggling British Bandsman magazine and also R Smith & Co music publishers and promoted a mass band concert at the Royal Albert Hall for Boer War veterans in 1900. He went on to found a national brass band festival at the Crystal Palace, heavily promoting it up and down the country along with a world tour by the famous old band, Besses o' th' Barn. John Henry Iles is most well-known for founding Dreamworld amusement Park in Margate and owned many such parks throughout Europe, stretching from Cairo to St Petersburg and including Belle Vue. By then he was the effective controller of both the National and British Open Brass Band championships. In 1919 he was elected Chairman of the London Press Club and in 1932 he was elected Master of the Worshipful Company of Musicians in the City of London, an honour to be later bestowed on his two sons and his grandson. John Iles thanked everyone who has been involved with the commemoration, and for the great honour that has been bestowed upon his grandfather.